Entrust in Fluidall to configure a DEF tank package complete with large bulk storage and mobile DEF dispense. Our portable DEF packages transport easily for refills in-shop, in-field and on-the-road. The market for Diesel Exhaust Fluid (DEF) is a result of the new emission requirements enforced by the EPA to meet the most recent Clean Air Act specifications. DEF is a high purity solution of urea in demineralized water (32.5%) which meets the automotive industry specifications defined by ISO 22241. A clear liquid similar in appearance to water, DEF is safe to handle by humans, pets and the environment. Its not explosive, flammable, toxic or subject to any hazardous product regulations. 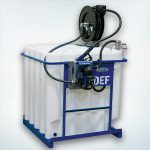 DEF is contained in a separate tank; never fill a diesel fuel tank with DEF. DEF is consumed at roughly 3% of diesel fuel consumption. For every 100 gallons of diesel, 3 gallons of DEF are required. DEF’s shelf life is calculated on atmosphere storage conditions. DEF will degrade as time passes due to temperature and exposure to light. If stored between 10°F – 90°F, DEF’s expected shelf life is one year. If the stored temperature does not exceed over 75°F for an extended period of time, DEF’s expected shelf life is approximately two years. OEMs and fleets equipped with Selective Catalytic Reduction (SCR) technology have seen fuel efficiencies ranging from 4% to 11%. SCR is the leading technology being used to meet 2010 emission regulations that uses a urea based DEF and a catalytic converter to significantly reduce nitrogen oxides (NOx) emissions. SCR process allows engines to operate at maximum efficiency, increasing fuel economy, and lowering costs.